WASHINGTON — The center core of the Falcon Heavy rocket that launched a communications satellite April 11 fell over after landing in rough seas, but SpaceX said the mishap won’t affect upcoming launches. 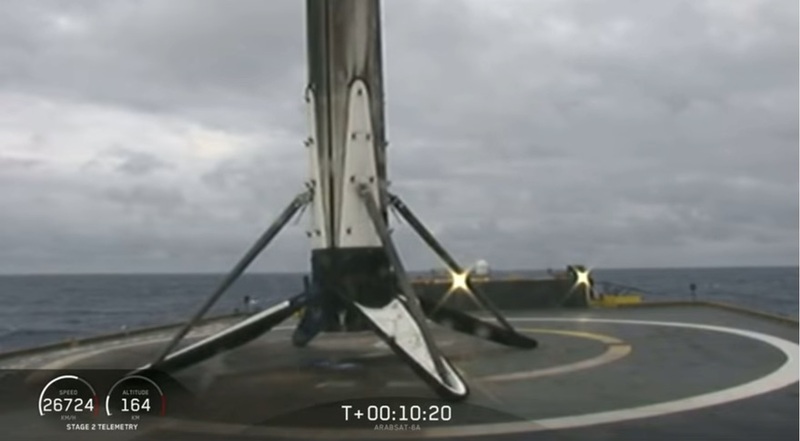 In an April 15 statement, SpaceX said that the booster core, one of three on the Falcon Heavy rocket, was unable to remain upright over the weekend because heavy seas prevented crews from securing the booster to the deck of the droneship Of Course I Still Love You in the Atlantic Ocean. SpaceX has developed a robotic system, colloquially known as “Octograbber,” to secure Falcon 9 booster cores that land on droneships. But company sources say that the Octograbber doesn’t work on the Falcon Heavy because it has different interfaces that the robot isn’t currently designed to grapple, requiring the use of personnel that could not safely operate in the heavy seas. “While we had hoped to bring the booster back intact, the safety of our team always takes precedence,” Gleeson said. SpaceX didn’t provide any information on the status of the booster core, including whether it will be retrieved at all. The droneship has yet to return to Port Canaveral, the port next to Cape Canaveral Air Force Station in Florida where SpaceX hosts recovery operations for boosters that land at sea. The mishap marred what had been a picture-perfect second flight of the heavy-lift rocket from Kennedy Space Center’s Launch Complex 39A. The rocket successfully placed its payload, the Arabsat-6A communications satellite, into a geostationary transfer orbit. The two side boosters landed side-by-side at the former Launch Complex 13 at Cape Canaveral Air Force Station, several kilometers south of the launch site. SpaceX also recovered the two halves of the payload fairing from the ocean shortly after they splashed down. SpaceX Chief Executive Elon Musk said in a tweet a few hours after the launch that the fairing will be reflown on a launch later this year of SpaceX’s Starlink broadband constellation, which may be the first reuse of the vehicle’s fairings. The two side boosters will be reused on the next Falcon Heavy launch, of the Air Force’s Space Test Program (STP) 2 mission, carrying a number of technology demonstration satellites. However, even before the center core from the Arabsat launch was lost after landing, SpaceX had planned to use a new center booster core for the STP-2 launch. “We do not expect future missions to be impacted” by the loss of the Arabsat booster, Gleeson said. That STP-2 launch is expected to take place in June, although no formal launch date has been set. The Air Force Space and Missile Systems Center, in an April 15 tweet, said the side cores “will require analysis to determine reusability.” The launch, it said, was scheduled for no earlier than June.